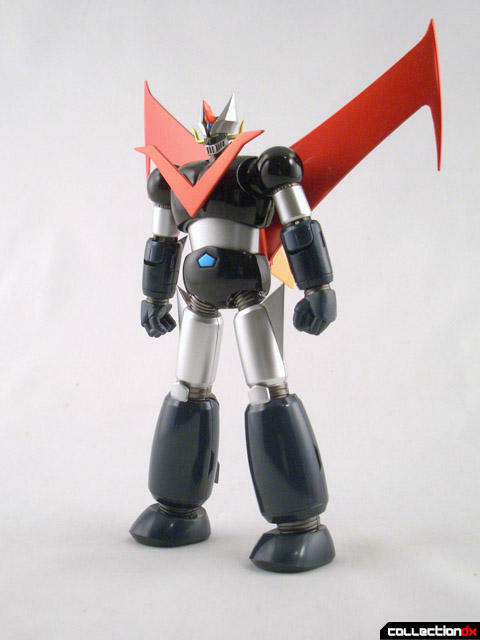 Bandai follows up their initial Super Robot Chogokin release with another Go Nagai creation, Great Mazinger. 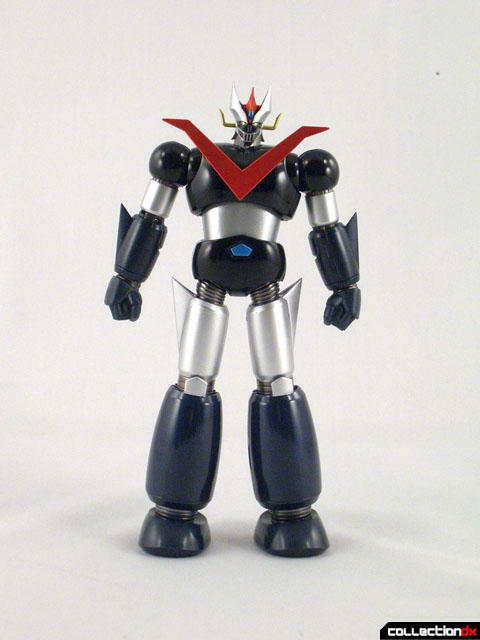 Now, I have never actually sat down and watched Great Mazinger, but he was ever present in my childhood growing up as most of my friends had him as either a Shogun Warrior or Jumbo Machinder. I always loved the look of the character and I have always wanted a nice Great Maz in the collection but not at the SOC/Jumbo Machinder prices. This new Super Robot Chogokin lines gives fans and collectors the chance to grab some classic and unique robot designs in metal and at an affordable price. The packaging is pretty standard fare for a Japanese figure release but I do find the four color graphics and art design of the box very sharp and eye catching. Inside the figure and all its parts and pieces are neatly stored in vacuum-formed trays. The SRC releases are a fusion of all of the best technological gimmicks of the various figure and chogokin lines to create a very affordable, hi-metal, highly posable line of robot goodness. 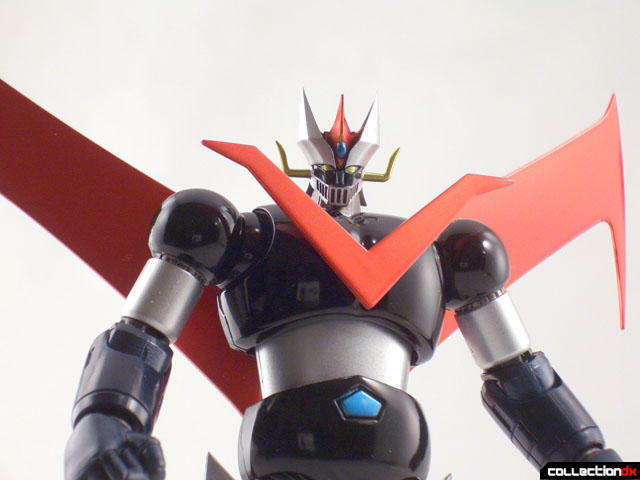 Great Mazinger is no exception. 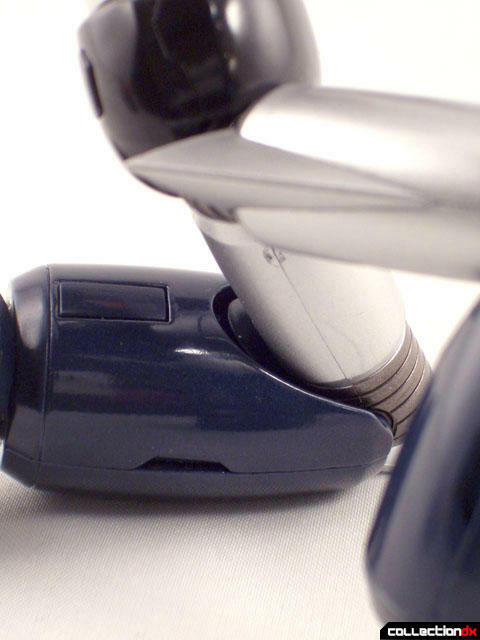 The front chest, hip joints and lower legs are made of metal. The rest is made of high quality ABS plastic. The fit and finish of this figure is very much on par with the quality and craftsmanship of the bigger (and more expensive) Soul of Chogokin line. Paint applications are all very sharp and clean with no under/overspray anywhere. It's a flawless specimen. 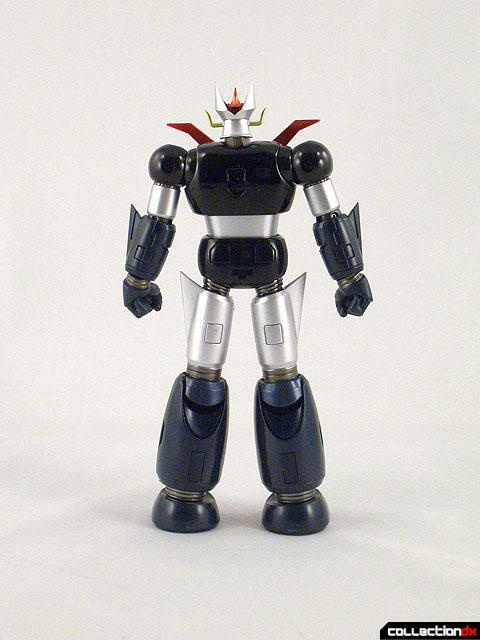 Great Mazinger stands just a bit over 5-1/2 inches tall and is highly posable. The shoulders feature a high range of motion utilizing the Saint Cloth Myth/S.H.figurearts ball and socket design. 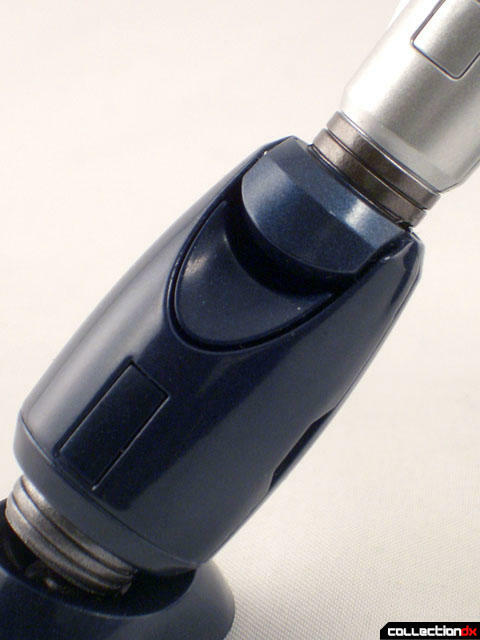 Elbows feature a double hinge joint with the top joint being a ratchet style and lower joint being a tension joint. The lower torso, waist and hip joints all expand out to allow a wide range of motion. I cannot find a pose it can't hold! Something I did forget to mention in my SRC Mazinger Z review but is featured on that and this release are the collapsing hatches behind the knees. This allows you to really get the legs in kneeling positions. I didn't notice it originally as the mechanism is so smooth and fluid it just works without you having to think about it. 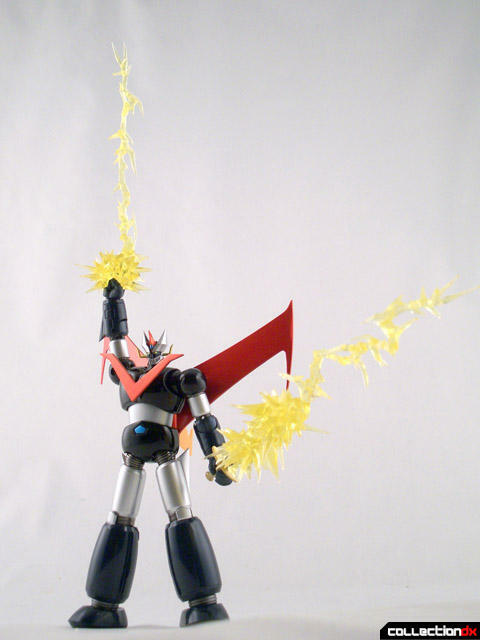 If you do have the Mazinger Weapon set you have two extra smoke trail/rocket punch effects left over. Well, you can use them with Great Mazinger. As you can see there is a lot of value packed into this little guy. This is a Japanese toy collector’s dream: great, high metal, high quality mini SOC's at a very affordable price. It is the ST line reborn for the 21st century. Highly recommended and I look forward to collecting the whole line. Is Super Robot Chogokin the best new toy line of the year? In this man's opinion, yes! And with all the news of the last few months- another weapon set for Great Mazinger (with new accessory parts for both Z and Great)- the two Japanese exclusives look great (the armored Mazinger and Mazinkaiser SKL)- plus the other anounced mechs- this line is awesome. 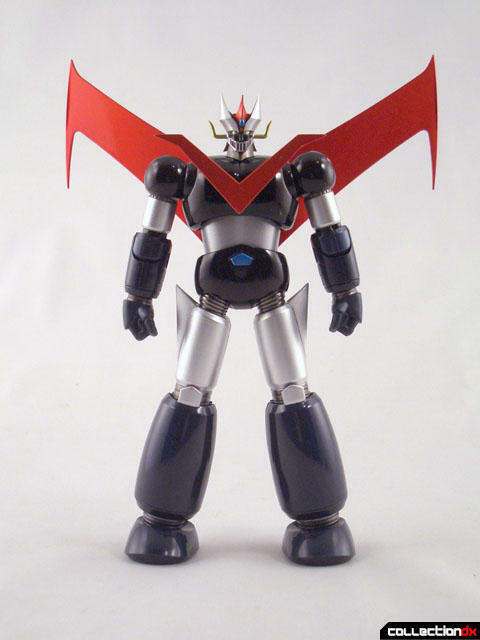 The SOC Great Mazinger GX-02R giant price spike a few years back was completely artificial and sad to see that it is still in effect. I skipped getting both Venus and Great for years, as they were easily found in the US for cheap and constantly available from Diamond Distribution as a set and individually for years. When Bandai announced that they weren't re-issuing GX-02R again and everyone on Y!J doubled and tripled their price within a week, despite sitting on huge amounts of stock (the first guy I saw up the price had over 20 in stock, all his "last one"!) Diamond sold out within two weeks as the spike continued on eBay. Keep in mind that Great and Boss were not good sellers by any means (at least here in the US.) and at the time you could get the two-pack set for under $80 most places, if not less. Now with the prices as they are for Boss Borot and Great (I won't pay a premium price for common items less than 20 years old, that's how you go broke in this hobby! ), I doubt I'll be able to afford to complete my SOC Mazinger team until others move on to something else "valuable". Hell Yeah! Inexpensive and awesome Super Robots, what else can anyone ask for???! Can't wait for the Weapons Pack 2 to be released, Mazinger Z needs a Jet Pilder and Iron Cutters!!! This toy line is just COOL. BANDAI's SUPER ROBOT CHOGOKIN is the ST line reborn for the 21st century! These robots also remind me of the Super 3D Show resin Super Robots by the great Hitoshi Hayami! In fact, the SRCs are approximately the same size as Hayami-sensei's creations. Personally, I intend to collect only the classical Super Robots of the 70s and 80s. 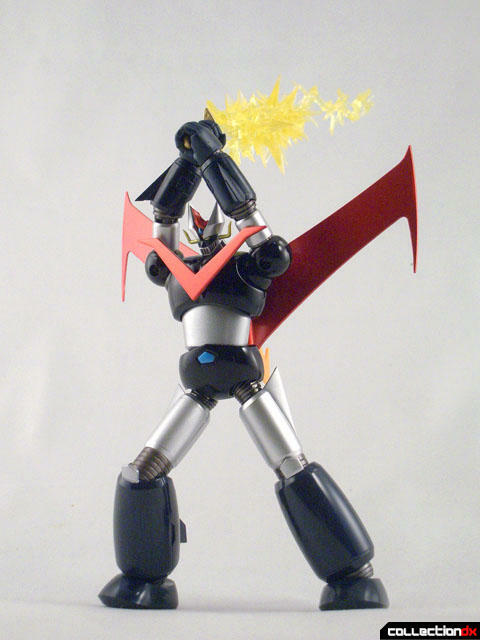 By the way, the creator of Great Mazinger is Go Nagai!!!! 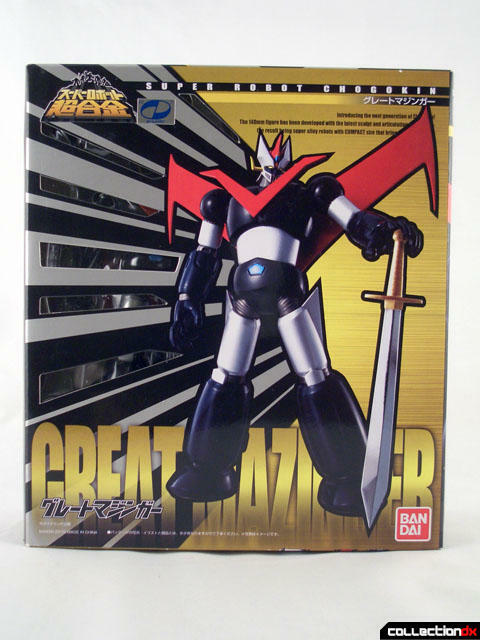 I sincerely hope they will release a Grendizer and Spazer too! Haha. Oops ;) That's what I get for not growing up in the Nagai era. I couldn't fit Fewture's version in my house and it's way too expensive for my liking. 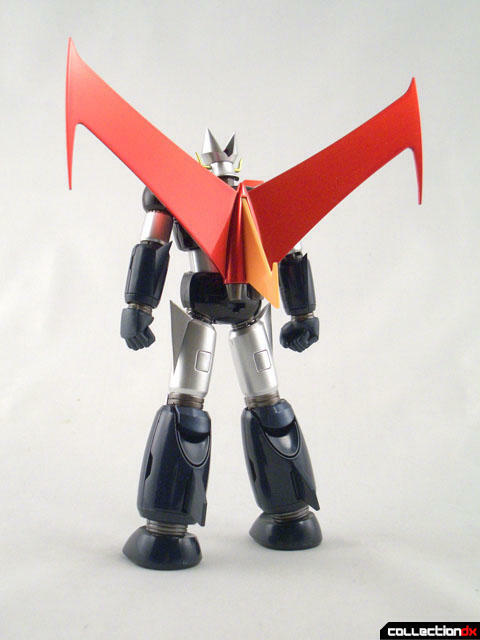 I would love for Bandai to get the license from Fewture to make a SRC version of Mazinger 1969. I cant believe Ive been sitting on this figure, (not literally since its pointy), since its release and I havent gotten around to opening it. 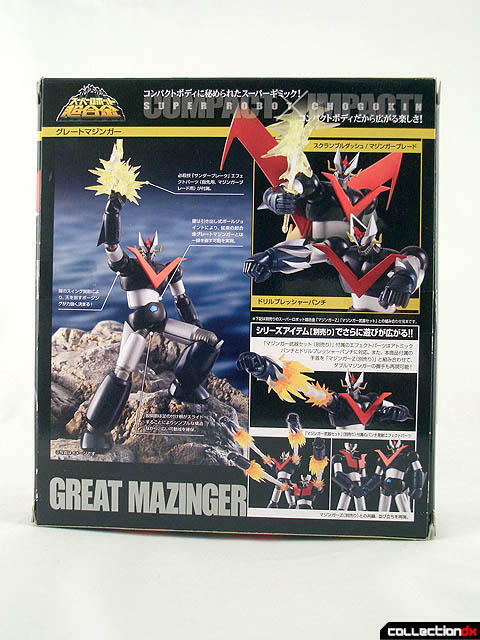 I opened Mazinger but not this one. I havent really gotten around to it yet, but after seeing this review and all the poses Atom threw at it, I just may have to dig this out of storage and check it out this weekend! How big is this thing? I thought the GX-02R was pretty small. In fact, my SOC Reideen to me seemed pretty small. Are these about the same size or smaller? In the review it says the toy stands 5 1/2 inches tall, pretty much the whole line is roughly that size give or take.